Different place, different pace. No clocks up just yet, no tv until tomorrow no newspaper until next Monday. Some morning radio but mostly the birds and frogs and crickets to mark time. And always the rustling cottonwood leaves, so I can hear what I feel, the cool breezes blowing through the many windows. That and the giant native trees with their cooling canopy make air conditioning completely optional so far. I’m taking time for time. Frequent pauses to appreciate all that is Good about me. Wide open spaces with friendly faces. A slower, gentler pace. Carl across the street is 82, Tom is 65, Gene 62. I’m the new with the emphasis on kid on the block. They’ve all moseyed over to introduce themselves and describe the proud history our little piece of heaven. Each dropping by astride their riding lawn mowers, trusty steeds, lamenting days of glory for the property that had been unattended for nearly 4 years. Linda & I worked hard on fences during a day long rainstorm last week. That didn’t go unnoticed and gained us instant acceptance by the Old Guard. They’re as anxious as we are to see the Bar None blooming. 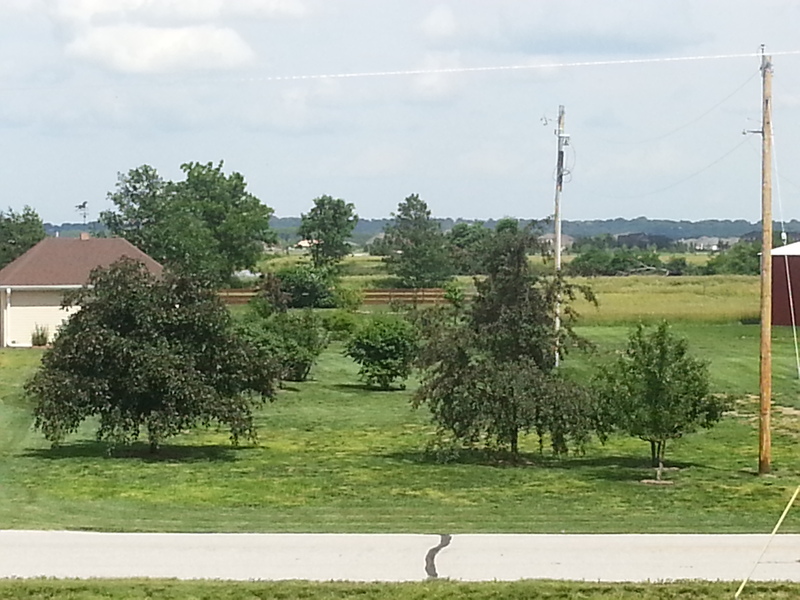 The view from the new home office. I added a loft during the renovation just for it. West Shores in the distance, the bluffs overlooking the Elkhorn River in the far distance. Long glances provide deep thoughts. A hot one at the track last night. Jenni Greer reacted with determination when I prescribed her one mile time trial. Dropped her personal best from 7:43 to 6:59. Forty four second improvement for one mile, that is worth repeating. 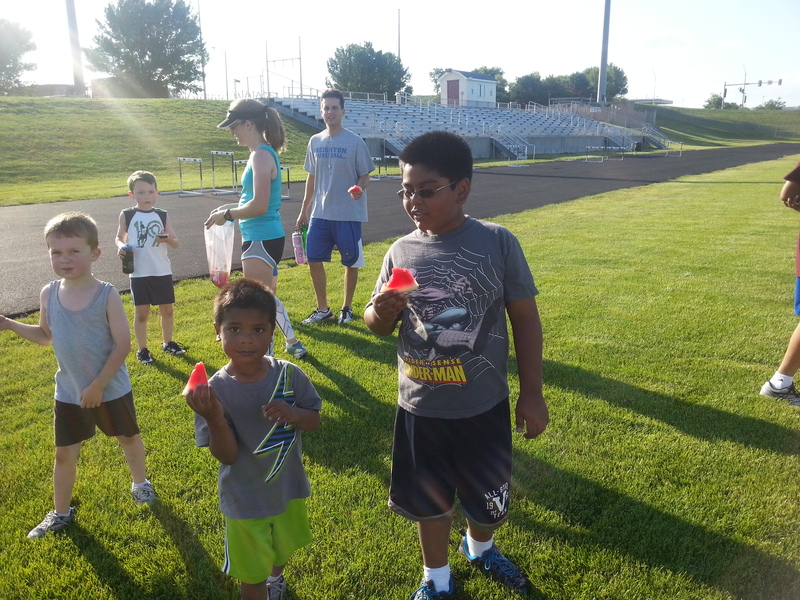 We all celebrated Jenni’s new Mile PR with cold watermelon, she surprised us at the conclusion of the evening with the tasty treat.. Linda had 10 tough kids show up for Kids Fit Program. All smiles! This entry was posted in Uncategorized on June 20, 2013 by runguru.